Take a big leap back in time. It is 1974, forty years ago. The planet has been cooling for thirty years. There is very real concern about this. The Pentagon is making Ice Age contingency plans. The scientific community is agnostic. There is realization that we are beginning to put a lot of particulates and CO2 in the air. The concept of the human volcano is developed, but the consensus is definitely that we just do not know how this is going to play. How is the situation different today? The spectral properties of CO2 in a jar were worked out in the 1950’s. They had been well known for two decades in 1974. We have definitely become the volcano. Shucks, we’re a Large Igneous Province. Yet after enduring three decades of cyclical warming, we have experienced a temperature plateau for an historic human generation. So let’s just make a list, bearing in mind the two perspectives of 1974 and 2014. What reasons do we have to expect that Carbon dioxide is dangerously warming the planet? 1. It is a gas that resonates in the earth’s outgoing spectral frequencies . 2. It is a gas whose increased human production correlated with temperature increase from 1976 to 1997. 3. It is a gas that occupies top dead center of the outgoing power spectrum. 4. The stratosphere cooled as the surface air warmed. That’s it. If you can think of any other reasons, please, help me out! Turn the worm and list the reasons to expect Carbon dioxide is not dangerously warming the planet. 2. The lower atmosphere has not warmed in a human generation. 3. Lower atmospheric temperature has been higher than today twice since the last glaciation and at peaks of the last interglacial period. 4. Ice core data show that historically temperature has controlled CO2. That’s it. These lists are very short. A sad measure of our understanding. We will include one last list of possible ways to reconcile the paradox, and to explore mechanisms how addition of large amounts of resonating gas might not warm the planet very much. 1. Scale. CO2 represents only 2% of H2O by mass in the atmosphere. These two gasses do nearly all the work. Everything else being equal one should expect the effect to be proportionate. Humans are thought to be responsible for about 1/4 of the total CO2 in the atmosphere so that would amount to half a percent. But things are not equal. Gasses do not resonate as a mass, they do it as individual molecules. Water has an atomic weight of 8 and CO2 has an atomic weight of 22. In any given mass there will be nearly three times as many molecules of water as CO2. The half a percent just got divided again. 2. Saturation. Lots of HITRAN measurements have resulted in an empirical parameter, “Absorption Factor” that describes a roughly logarithmic diminution of effect by concentration. Compare this to the entire outgoing earth spectrum. The units are different but the saturated bands at 15 microns in the first image from realclimate are the big shark bite out of the middle of the piece of pie here. This cancels concern number 3, that CO2 occupies the top of the power spectrum. It also means that many of the teeth in that bite may come from water, whose absorption spectrum overlaps. There are actually two different kinds of saturation in play. 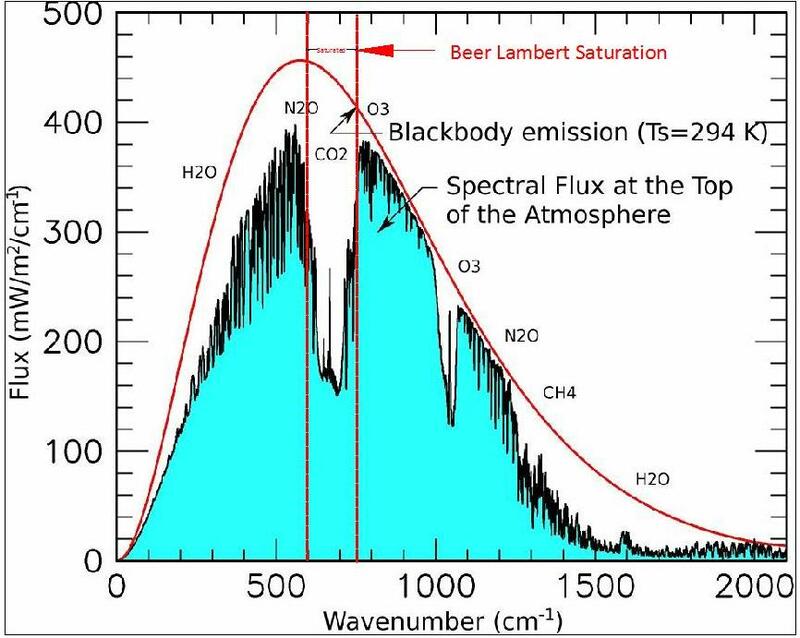 One is the absorption factor saturation where adding more gas has little effect. The other is light saturation where adding more light has little effect. The entire outgoing spectrum is light saturated. There is confusion here because light is considered a constant, yet more light energy cycles between resonating gasses and the surface than the earth receives from the sun. Greenhouse gasses effectively create more light by recycling the energy in the system..
3. Effective Sequestration. Most of the action in the photon food fight takes place near the surface where water in the atmosphere is strongly concentrated. Statistically, a molecule of CO2 has little chance of getting in the game. 4. 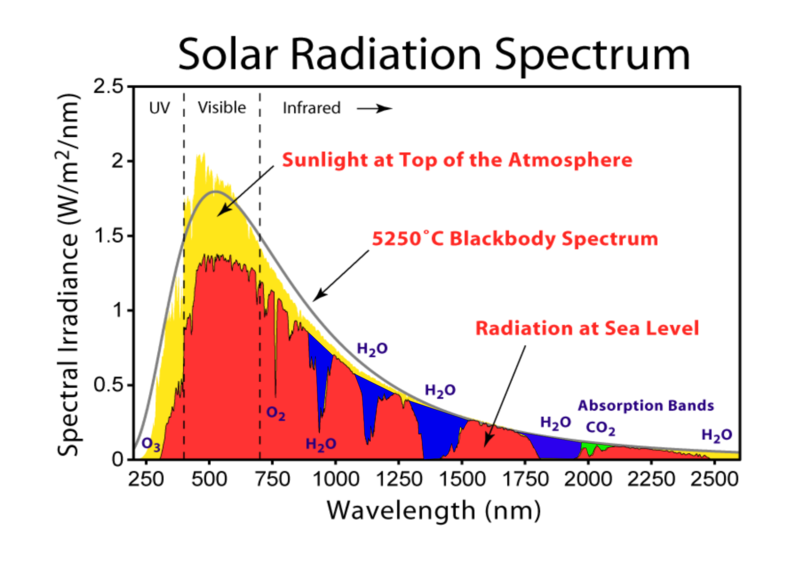 About half of the “greenhouse” effect is not related to outgoing or foodfight recycled radiation, but rather from direct absorption of incoming solar radiation. 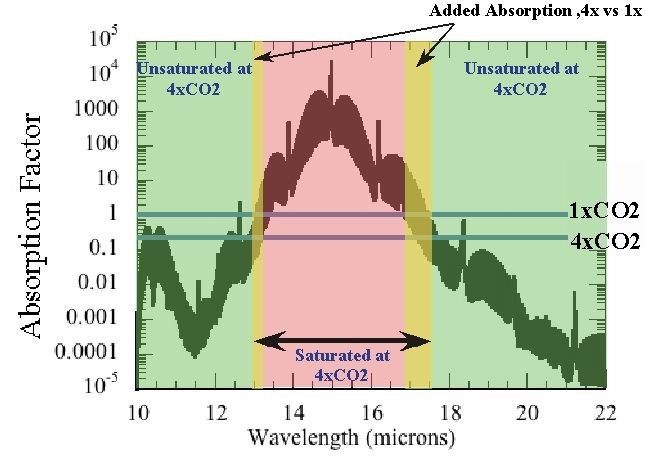 Water is very active in these spectra and CO2 is a wimp. Blue is water, green CO2. 5. The very existence of the pause guarantees that there are natural forces at least equal to our production in play. Another short list. 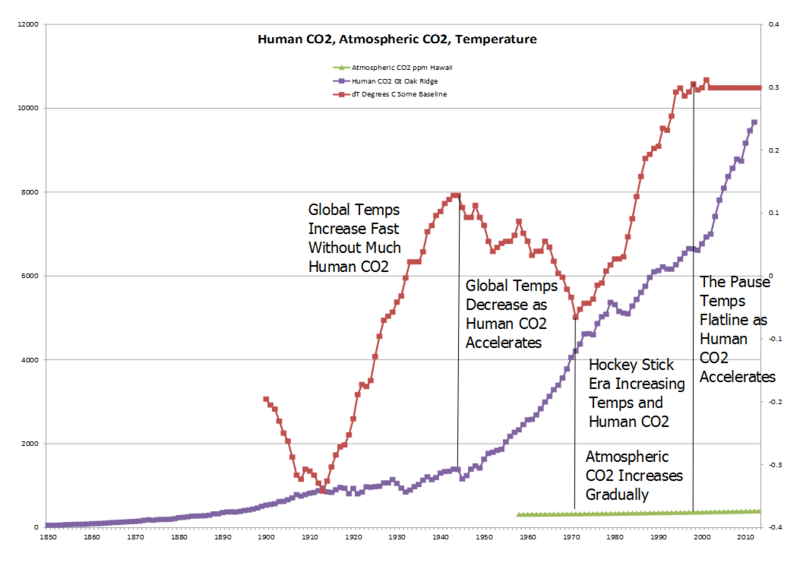 In 1974 there had never been a credible correlation between human CO2 and temperature. We were well aware of the Physics as we are today. In the last 40 years we have seen temperatures rise and suddenly level off as our production of CO2 has accelerated. Computer models predict temperatures will rise and cyclical models predict they will fall. In the end, we find ourselves in a situation much like 1974. This entry was posted in Climate, Climate Change, Cold is the New Hot, Global Warming, Greenhouse Effect, Greenhouse Spectra, Large Igneous Provinces, Photon Food Fight, Spectra, the "Pause" and tagged Carbon dioxide, global warming, Greenhouse gas. Bookmark the permalink.